The ZT series is the superb choice for performance and power users who need solid, reliable PSU. With a completely modular design, ZT Series keeps your internal case environment organized by eliminating wire clutter and improves airflow by using only the cables you require. Kept supremely cool with a load-controlled 140mm fan, the OCZ ZT Series PSU was engineered to be ultra-quiet by eliminating distracting noises from your PC when working or gaming. With an 80-Plus Bronze Certification featuring up to 85% efficiency under typical load environments, this power supply remains rock solid and stable under pressure. 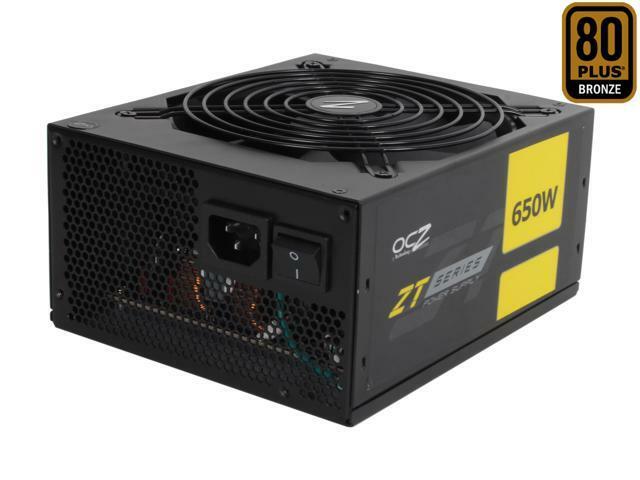 650W Continuous Power with Single Strong +12V Rail The OCZ ZT Series OCZ-Z650W delivers 650W continuous power output rated at a demanding 45°C ambient temperature to deliver power as needed in a real world operating environment. Powerful single +12V rail at up to 54A design ensures the maximum provision of 12V power to energy-hungry CPU and VGA card perfect for future high-end component upgrades or overclocking. ATX12V V2.2 Compatible Compatible with the ATX12V v2.2 standard, the OCZ ZT Series OCZ-ZT650W power supply provides maximum power stability to drive the latest Intel and AMD processors as well as other system components. Ultra-Quiet 140mm Fan Built-in load-controlled, ultra-quiet 140mm double ball-bearing fan guarantees excellent cooling performance as well as silent operation. Fully Modular design Modular cable design provides organized cable management and improved air circulation inside the computer case. Premium capacitors and superior protection The OCZ ZT Series OCZ-Z650W incorporates premium low ESR 105°C electrolytic capacitors ensuring performance, reliability and long life cycle. It also features heavy-duty protection circuitry (over-voltage, over-current, under-voltage, and short circuit) for protecting your valuable components from damaging. UL, CUL, CE, CB, FCC Class B, TÜV, CCC, C-tick. 5.9" x 3.4" x 6.9"
Safety Approvals: UL, CUL, CE, CB, FCC Class B, TUV, CCC, C-tick. 6.9" x 5.9" x 3.4"
This item is covered by FirePower Return Policy. Pros: this 650w has been going strong for 4 years now and still ticking. very satisfied. Other Thoughts: I'd recomend this to other people, sure. Pros: Was quiet, didn't overheat and I really liked the fully modular cables which made replacing it easy. Cons: Got a bad unit that kept browning out under moderate load. Had it tested and it would cut out around the 350w area. Tried to get it returned but the company website was being rebuilt or something so never heard back on my request. Ended up just getting a different psu from another company. Pros: Powered 2x 6870 SLI without any problems but I had to remove Creative X-fi and on board audio is just too terrible. Decided to sell 2 6870 for 1 7850 which I still have. I think the amps are enough to handle almost any single GPU honestly. 54A on the rail and most GPUs require about 45 amps. Cons: It's price has gone up. I got on sale for $89 years ago. Other Thoughts: Solid investment to pick OCZ at the time. Pros: It’s been running flawlessly since I bought it in May 2013 before Firepower (formerly PC Power & Cooling) took over. Other Thoughts: OCZ must have commanded some respect from its peers with Firepower taking over it's power supply unit and Toshiba buying its SSD unit. Pros: Looks pretty and cheap price. Cons: Died after one month and "you get what you pay for."